Whatever issue you’re faced with, Garage Door Repair Jacksonville can provide the assistance you need. Our comprehensive service includes repair, maintenance, and installation, and is available throughout the city and the surrounding areas. From dented doors to broken brackets, our wide selection of services are designed to tackle all kinds of problems. We specialize in manual and automatic garage doors, providing effective and experienced repair and replacement services and solutions. Be it your door refusing to open, stuck half-way, or simply being stubborn - we are the team for the job! A broken spring in your door means big trouble. Without a functioning spring, your door simply isn’t going to open. 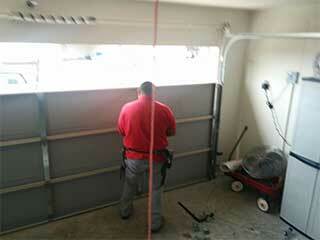 Fortunately, our company specializes in garage door spring repair. Whether your spring is rusty, misshapen or has completely snapped, we can repair or replace the part in quick fashion. A malfunctioning opener can quickly lead to a lot of stress and worry, even if your car isn’t trapped in the garage. As part of our garage door repair service, our technicians can repair automatic doors, sensors, motors and remote controls, limiting any inconvenience caused to you. In addition to repair work, we also carry out routine inspections and maintenance work to ensure your door doesn’t just open but glides open. We can take care of lubrication, upgrades, safety checks/inspections, including testing of electronic motors and remote controls, and undertake preventative measures to give your door a longer lease on life. Contact us today to find out more about Garage Door Repair Jacksonville and the services we offer!